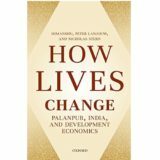 [Book Launch] “How Lives Change: Palanpur, India and Development Economics” by Himanshu, Peter Lanjouw and Nicholas Stern. The Centre de Sciences Humaines (CSH) is pleased to invite you to the workshop on “Seven Decades of Palanpur” on the occasion of the launch of the South Asia edition of “How Lives Change: Palanpur, India and Development Economics”, the third edition of Palanpur books by Himanshu, Peter Lanjouw and Nicholas Stern. The Book has been published by Oxford University Press. The workshop will present findings from the seven decades of surveys in Palanpur, a small village in Moradabad, Uttar Pradesh. Palanpur offers a unique opportunity to examine some of the issues that have been fundamental to understanding how lives change, a core concern for development economics and policy. There are seven surveys of the village, one for every decade since independence led by researchers who lived in the village for long periods examining its society, politics, institutions and economics. Palanpur has evolved from a very poor, fairly closed, farming community with a rather rigid social structure, to a significantly less poor village with a diversified portfolio of economic activities and extensive links to the outside world. The emerging story of the integration of the village economy with the outside world in a rapidly transforming Indian economy and society offers important lessons for understanding pathways to sustainable development not just for India but also for other developing countries. We hope you will be able to join us for the workshop and the book launch. The event will take place on 15th February 2019 from 2:30 pm onwards at Seminar Hall 1&2, India International Centre (IIC), 40, Max Mueller Marg, Lodhi Gardens, Lodhi Estate, New Delhi, Delhi 110003. Development economics is about understanding how and why lives change. “How Lives Change: Palanpur, India, and Development Economics” studies a single village in a crucially important country to illuminate the drivers of these changes, why some people do better or worse than others, and what influences mobility and inequality. How Lives Change draws on seven decades of detailed data collection by a team of dedicated development economists to describe the evolution of Palanpur’s economy, its society, and its politics. The emerging story of integration of the village economy with the outside world is placed against the backdrop of a rapidly transforming India and, in turn, helps to understand the transformation. It puts development economics into practice to assess its performance and potential in a unique and powerful way to show how the development of one village since India’s independence can be set in the context of the entire country’s story.